Had a cheeseburger last night, on homemade almond flour buckwheat flour bun. 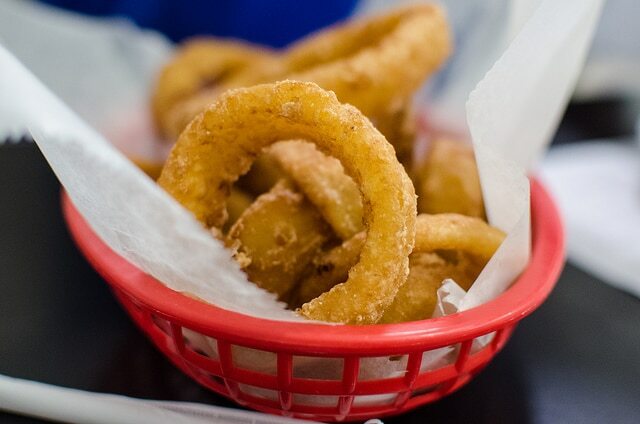 We love onion rings, but only homemade, the ones at the store are awful, and breaded with wheat. I am doing a large cooking spree with homemade chicken soup and spaghetti sauce with spareribs and mixed veggies - and fresh parsley from my garden. I think I'll also cut up an eggplant and grill it then melt boccochini cheese all over it. (06-15-2017, 09:23 AM)JayRodney Wrote: Had a cheeseburger last night, on homemade almond flour buckwheat flour bun. ..for how much longer is the question tho.. I don't have the knack..
Classic Suddenly Salad and we added Crab meat to it, and baked a loaf of garlic bread. Nice Cold Salad, we just hit 102F here at 5 pm. Eating habits change a lot when it's like that, mashed potatoes and gravy move way down on the list. I'm loving the Spanish tapas, tortilla españa, patatas bravas, and croquettas. If I stay here much longer I may not leave. I have not eaten in the last day. Think I will make up some Tuna & Crackers. Opened that can of Tuna, and went yuck !!! I love her, she means well. Think I will warm up the Marshall amp, and get lost !! !